WHO: Marilyn Harper, Adironnda & Company, 12 like-minded individuals and the Big Kahuna within. WHY: To celebrate the 11/11/14, acclimate to the power of the 5th Dimension and transcend into instant manifestation. or email info@adironnda.com, $577 deposit requested. “What you think about, you bring about,” now, more than ever as we enter into the 5th Dimension. and attune to the Higher Dimension. 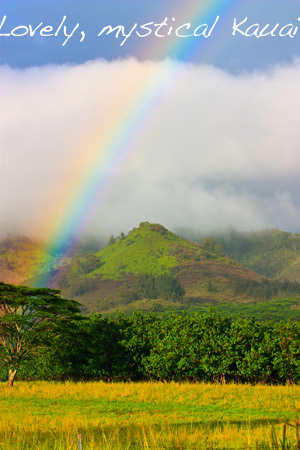 Kauai, Hawaii is the perfect place to experience the thinning of the veils and anchor in the feelings of instant manifestation and the truth of 5th Dimensional bliss. Here, at Hannalei Bay, you will acclimate yourself to the transition, transform your consciousness and easily raise your vibration to match the new frequency. Snorkel, swim, and relax on the beautiful beaches of Hannalei Bay, Kauai. connect to the healing Kahuna within you. The island of Kauai is the oldest and northernmost island in the Hawaiian chain. It is draped in emerald valleys, sharp mountain spires and jagged cliffs, aged by time and the elements. One step onto the island will give you God-bumps. You’ll experience Kahuna mysticism with daily messages from Adironnda & Company, further enhancing your journey. From the soaring cliffs of the Napali Coast to the vast chasms of Waimea Canyon, Kauai embraces the senses like no other destination. We will explore the island via land to experience settings you’ve most likely dreamed about, and set foot on sacred land that will tingle your physical being. Also, you may choose an optional side trip of exploring the Kauai coast by air for views that are beyond imagination, and or by water for embracing ancient underworlds and ancestors. Kauai has over 5o-miles of heavenly beaches from Poipu Beach to Hanalei Bay, where we will be staying. There will be group activities to enhance your Spiritual experience as well as personal time for rest and relaxation. Bikes and snorkeling gear are available at our residence, and swiming in the beautiful and famous Hanalei Bay is steps away. There will be a group session each evening with Adironnda. You’ll also be free to snorkel, swim, bike, and explore the beach, daily. Arrive early for an optional pre-event helicopter ride on Saturday, or, depart a day later for a post-event Snorkeling excursion on Friday. Optional events require 1 additional night stay, each. Stay just minutes from the beautiful beaches of Kauai with your back to the mountains most sacred area. Your resort lodge had private rooms for two, separate beds and each with their own private bathroom. There is also a swimming pool, spa and meditation gardens. It is a short walk or bike ride to world famous “Anini Beach”. To get to Kauai, you can fly directly into Lihue Airport (LIH), or you can fly into Honolulu and take a jumper plane to ,Kauai. We have arranged for a special travel agent to help arrange your flights. Transportation from airport included. $577 deposit holds your spot, you are welcome to make payments. PLEASE NOTE: The 5th Dimension Living Retreat is limited to 18 people, first-come-first serve, $577 minimum deposit requested. AIRFARE is not included. Plan to fly directly into Lihue Airport, Kauai (LIH) or jumper flights into Kauai are available via Honolulu (HNL). Payment: We accept VISA, MC, Paypal, personal checks or cash. We also gladly accept payments up till 60 days prior to the event. After 60 days out from event please contact info@adironnda.com for possible availability. Cancellation: Retreat must be paid in full due 60 days prior to arrival. If cancellation is necessary between 60 -30 days prior to arrival 1/2 payment will be refunded. If cancellation is necessary less than 30 days prior to event, we reserve the right to offer no refund unless your spot if filled with another participant. If cancellation is prior to 60 days from arrival all will be refunded except a $250 reservation fee. We know sometimes emergencies arrive, please contact us for cancellation arrangements. Looking forward to seeing you in Kauai – Aloha!! !